The AN/FPS-117 is a fixed position, solid state, long-range, three-dimensional radar that provides airspace surveillance. [i] It consists of a primary radar, a secondary radar, and a subsystem for simulation. Designed to be part of the American-Canadian North Warning System, AN/FPS-117 provides long-range detection and coverage for drug interdiction support and tactical command and control. [ii] The system boasts a pencil beam capability that allows for complete flexibility in customizing the beam patterns to optimize performance in challenging terrain and clutter applications. [iii] Operating in the L-Band frequency, the AN/FPS-117 has a range of 470 km and enhanced weather and clutter mapping displays. It is used dually for air defense and air traffic control. The AN/TPS-77 is the transportable version of the AN/FPS-117. 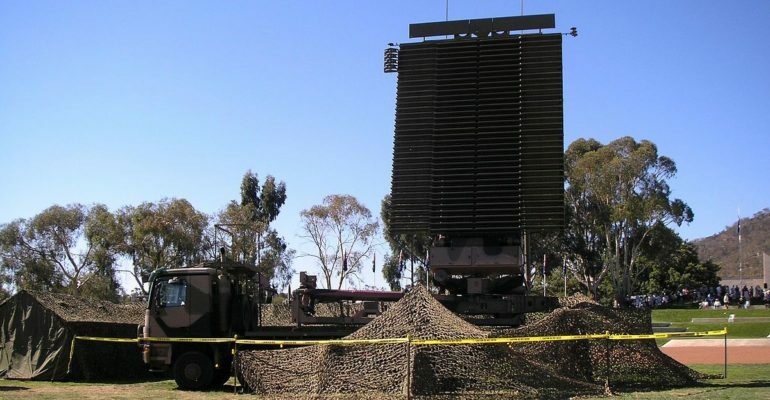 The AN/FPS-117 radar is strategically valuable because of its inherent ability to rapidly respond to attempts at jamming and anti-radiation missiles. [iv] Specifically, the AN/FPS-117 radar is capable of randomly hopping among 18 channels in the 1215-1400 MHz band allowing it to counter jamming. [v] Also, its pencil beam architecture also offers the advantage of “looking down” from elevated sites to detect aircraft in valleys, minimizing the possibility of enemy targets slipping by unnoticed. [vi] AN/FPS-117 can be placed in rugged terrain and high conflict areas, while maintaining its peak performance, making it a very diverse radar.